Aquarius is a school-bus-sized structure equipped like a camper that sleeps six, except this camper is pressurized to match the water pressure outside. That’s why Aquarius can have a Jacuzzi-sized opening in the floor, but the seawater stops at the brim, and the “aquanauts” inside can don gear and come and go at any time of day or night. And when they’re not in the water, they can peer through several large portholes, taking in the ever-changing view a few miles south of the Florida Keys and almost 60 feet below the surface. SEALAB I in transit to Bermuda in 1964. In live-streaming videos and Skype sessions, Cousteau and crew made it all look pretty routine. That was not the case 50 years ago this week, when four U.S. Navy divers swam into the first American sea-floor “habitat,” called SEALAB I—the Roman numeral optimistically suggesting that it would not be the last. 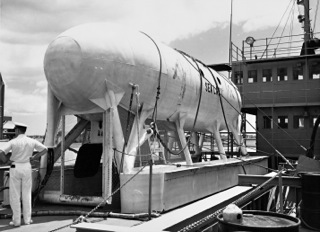 The Red Sea venture was one of just a few preliminary forays into sea dwelling that preceded SEALAB I, but the U.S. Navy’s sea base was the first to tackle both a substantial depth and a prolonged underwater stay. In late July 1964, the 30-ton steel vessel resembling a stout submarine was lowered by crane nearly 200 feet below the Atlantic surface, about 25 miles southwest of Bermuda (a few hundred miles northeast of where Aquarius is). It was a pivotal experiment in the science of “saturation diving,” the brainchild of Navy Captain George F. Bond. In the late 1950s, Bond, an iconoclastic medical officer and the father of SEALAB, began leading a group of Navy scientists and divers in a series of experiments—first with animals and then human volunteers—to explore the potential of a concept that would enable divers to go deeper and stay down far longer than ever thought possible. They called it saturation diving because it involved allowing enough time for a diver’s body to fully absorb and become saturated with the gases breathed under the pressure of a given depth. The deeper the dive (and the greater the pressure), the more gas saturation that can occur. It’s a little like a physiologically complex version of allowing a dry sponge to soak up a liquid—until it’s fully saturated and can absorb no more. 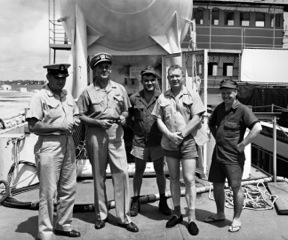 Standing at one end of SEALAB I with Captain George Bond, second from left, are the first SEALAB aquanauts, Robert Barth, Lester “Andy” Anderson, Dr. Robert Thompson, and Sanders “Tiger” Manning. With saturation diving, decompression would still be required, but it could be postponed indefinitely. In the meantime, a diver could spend an indefinite amount of time at a given depth and basically camp out on the seabed. Bond and his Navy group knew they would need some kind of shelter, like a mountaineer needs a tent or an astronaut needs a space station. On a slim budget—thousands, not millions, of dollars—they came up with SEALAB I. Instead of mere minutes at a depth of 200 feet, saturation divers could become part of the marine environment, in Bond’s vision, living and working on the seabed for days, weeks, possibly even months. The SEALAB-style setup was risky, but it didn’t seem to prompt an outpouring of popular concern like, say, the prospect of burning up upon re-entering the Earth’s atmosphere. For example, once a saturated diver was on the bottom, swimming for the surface for any reason—sickness, panic, habitat failure—was not an option. Death would come even before reaching the surface from “explosive decompression,” a fate that’s as nasty as it sounds. Saturation diving required a longer and more involved decompression process than conventional diving—the SEALAB I aquanauts would need to spend more than 50 hours crammed into a dank prototype capsule no bigger than an elevator. 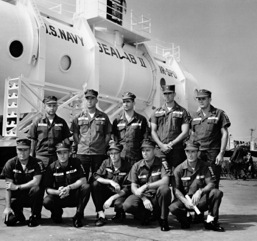 The first of three aquanaut teams poses with SEALAB II in 1965 at the naval shipyard in Long Beach. Scott Carpenter, the former Mercury astronaut, is second from left in the front row. There was also the nitrogen problem. When nitrogen is breathed under the pressures experienced at more than 150 feet or so below the surface, it causes a kind of inebriation that makes a diver behave like a drunken sailor. SEALAB I solved the problem by replacing a lot of that nitrogen, which makes up four-fifths of ordinary air, with helium. But it also gave aquanauts falsetto voices that sounded absurdly like Donald Duck, a phenomenon familiar to anyone who’s ever inhaled from a party balloon. An impending hurricane forced the Navy to cut the intended SEALAB I mission of three weeks short by about half, but that amount of time was still unprecedented at such depth. And, despite a few dicey moments, SEALAB I gave the Navy sufficient confidence to put more money and personnel into SEALAB II, a larger and more refined habitat that was placed the following year off the Southern California coast, about a mile from La Jolla. There, darker and much colder water conditions added a considerable degree of difficulty, making for a tougher test of new systems and procedures. Also adding to the difficulty was accommodating many more aquanauts—three teams of 10 aquanauts were lined up to spend two weeks each living and working on the seabed. Scott Carpenter, the former Mercury astronaut, stayed down for a full month—no small feat at the base depth of 205 feet. 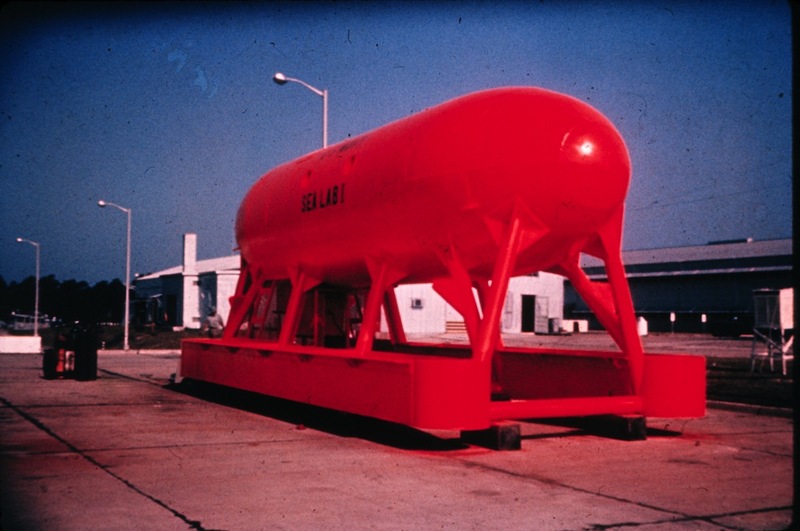 The success of SEALAB II emboldened the Navy to place SEALAB III at the daunting depth of 610 feet off the coast of Los Angeles, near San Clemente Island, in the winter of 1969. They had hopes of hitting another first in human exploration just before Neil Armstrong and the rest of the Apollo 11 crew headed towards the first moon landing. Jacques Cousteau’s son Philippe was on the aquanaut roster and Bond was in on a plan to have footage shot for a future film. But in the wee hours of February 17, 1969, tragedy struck. Just as the most ambitious of the three SEALABs was getting started, an aquanaut died under mysterious circumstances outside the habitat just as it was about to be occupied. Instead of a triumphant 60 days filled with pioneering military and scientific projects, and possibly even a Cousteau-produced film, SEALAB III suddenly became fodder for a month-long Navy investigation at SEALAB’s operational base in San Diego. There was tense talk of technical difficulties, human error, and even allegations of sabotage. The program languished for about a year before it was quietly canceled—one reason you may not hear much about SEALAB’s 50th anniversary. But the program’s legacy endures in the form of diving depths and durations once thought to be impossible for a human diver to reach. Even after the Navy got out of the business of building habitats like SEALAB, for instance, it continued to use saturation diving methods for undersea espionage, including on Cold War missions to tap Soviet communication cables along the sea floor. The offshore oil industry picked up on saturation diving early on to create an underwater workforce capable of putting in long hours on the front lines of drilling operations that were moving into deeper waters all over the world. Marine scientists gained a new window—and door—into the sea, and explorers like Fabien Cousteau point out that there are still many to open. So does the staff at the Aquarius Reef Base, which named the boat that shuttles divers between the Keys and the base the George F. Bond. Ben Hellwarth, a Los Angeles-based journalist, is the author of SEALAB: America’s Forgotten Quest to Live and Work on the Ocean Floor (Simon & Schuster, 2012). *Lead photo courtesy of NOAA. Interior photos courtesy of Ben Hellwarth.